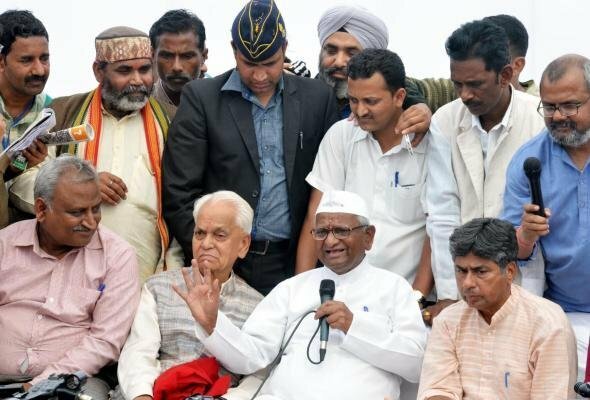 New Delhi(PTI): Anti-corruption crusader Anna Hazare on Thursday asked for "open debate" with Prime Minister Narendra Modi on the controversial clauses of the Land Acquisition Bill. In response to a query about Union Minister Nitin Gadkari's willingness to debate the bill with those opposed to it, Hazare said, "Gadkari's homework is weak. We are ready to have an open debate with the Prime Minister on camera to discuss the issue threadbare." "Let the people watch this debate and see the facts for themselves," Hazare said. Social activist Hazare is currently campaigning against the NDA government's amended Land Acquisition Bill. Earlier, Gadkari had said that the government was willing to debate all aspects of the bill, which is awaiting clearance in the Rajya Sabha. A united and aggressive opposition, led by the Congress, is blocking the Bill's passage in Rajya Sabha and had submitted a memorandum to President Pranab Mukherjee last week, terming the Land Bill as "anti-farmer." Gadkari, while claiming that the opposition parties were criticising the Bill for "political reasons," had invited all leaders of major parties as well as Hazare for an open debate on any platform to discuss the nuances of the proposed law.